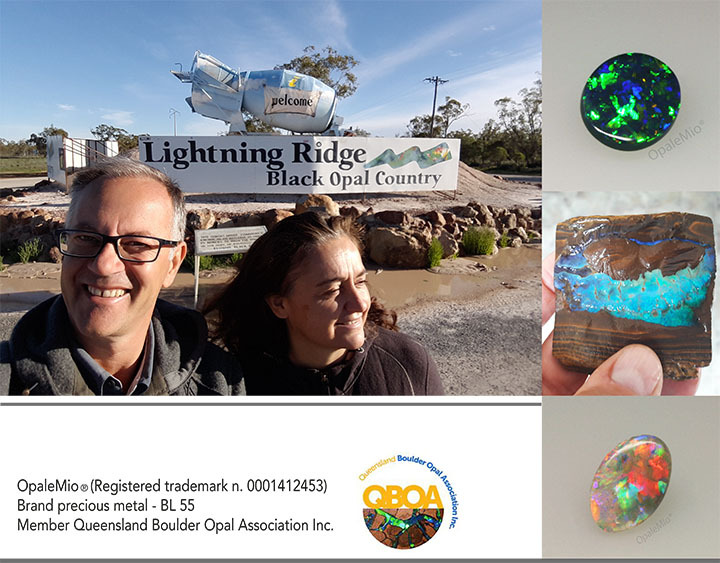 OpaleMio® We are a family business which imports and cuts rough opals from around the world, turning them into gorgeous multi-coloured gemstones. We've been impressed by the beauty of the opal since the first time we saw it. The pattern, the shades, the colours that the nature has been able to enclose in such a small gemstone are incredible. We do hope to be able to make the italians able to discover and appreciate it. You will be able to find opals coming from all around the world, with a particular preference for the ones coming from Australia. In fact the australian opals usually turn out to be more stable, unique for their colours and hardness. We tool neither doublets nor triplets but just solid opals, the result of a careful research and selection. In fact every opal has its own quality certify. We select rough opal buying it both from miners and rough-gems wholesalers from the origin countries. Then, in our workshop, we trasform it for you. Each opal is processed by our hands with the aim of exalt its inner beauty. Buying one of our opals you will be absolutely sure of acquiring a gemstone that will be able to delight you and give you long-life satisfactions.